Chairman Oakenfold issues his State of the Union. WHEN PEOPLE ASK ME how I met Paul Oakenfold, I love telling them the truth: I picked him up in a gay bar in South Beach in 1994. This is not to say that Oakenfold, or “Oakey” as he’s affectionately referred to, is gay by any means, because he’s not. But the bar, Mickey’s, owned by Mickey Rourke, was South Beach’s hot spot of the moment. And Oakey being Oakey, is patently at the forefront of the latest trends in everything—a practice he follows in all his activities. 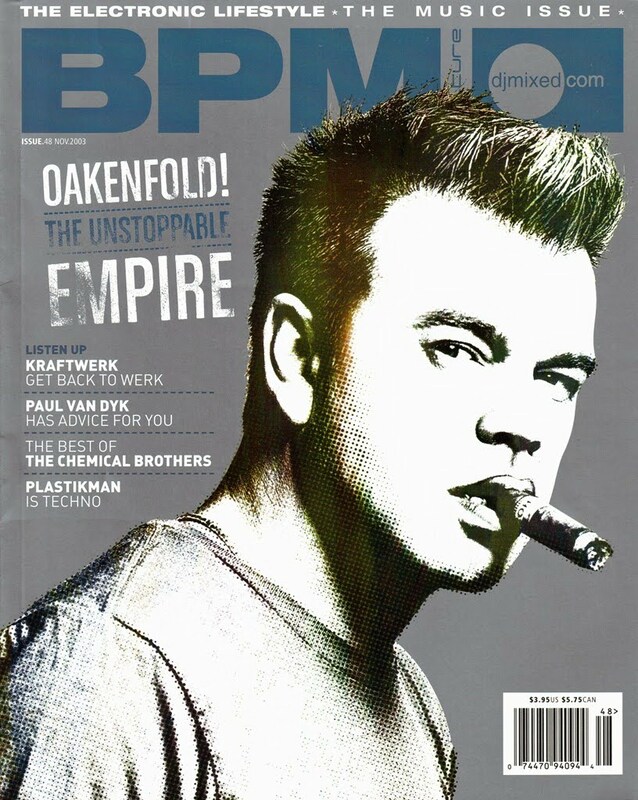 Despite his outward endeavors to take things to the next level, the 39-year-old British-born Oakenfold is endlessly derided and continually misunderstood. Rumors of astronomically undeserving DJing fees are bandied about, supposed outrageous decadent acts are gossiped over, snobbish behavior is implicit, dislike of America is assumed, and most droll is he’s not making his music himself. As is always the case, a little bit of success, and you are the beef everybody has with their life. But Oakenfold doesn’t cater to this lowbrow attitude. He staunchly won’t respond to any of the challenges or disparaging accusations his counterparts aim his way. If there’s an occasional Learjet involved in his transportation, it is provided by promoters for their own ease of mind due to his hectic schedule, not demanded by him. He doesn’t own a car, either in the UK, where he lives in a modest house, preferring to take cabs, or in Los Angeles, where he intermittently resides, renting a house from a friend and using a rental car. 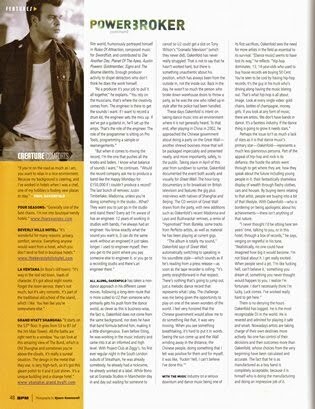 On his down time he’s at his local pub with people he has known since his school years, not talking about the music business. He goes to movies, to restaurants and to the theatre. He keeps a low profile when he’s not in the public eye and doesn’t have any notable new friends since his own celebrity has risen. He wears beautiful clothes, but that’s an indulgence even us poor people have. When he meets me at the Chateau Marmont in Los Angeles at the tail end of a three week DJ tour of North America to talk about his new mixed CD: Perfecto Presents...Paul Oakenfold The Great Wall, he and I are wearing the same shoes: low top denim Converse All Stars. “Am I late?” he shouts across the lobby, from behind bug eye-shaped shades, a baseball cap with a headphone emblem on it hides his hair, as he stumbles down the handful of steps into the sitting area, the DJ bag he’s using as a purse weighs him down. He’s dressed modestly for Oakenfold, green combats and a white Perfecto FC t-shirt, which has a horrifying brown make-up streak on it, left by me after our hello hug. It is revealed this overly casual look is the result of a heavy evening out the night before. At odds with his customary low-key manner, Oakenfold went to a new club, ending up at a house party in Bel Air until the early hours, and now he’s hung over. Oakenfold is comfortable here. The Chateau’s accommodating atmosphere and warm environs make it homey in its lavishness, kind of like Oakenfold himself: nice and safe. OAKENFOLD’S CAREER was already at legendary proportions when we met in 1994. He established the sound of acid house in the late ‘80s with Spectrum and Future, his groundbreaking club nights. He brought Jazzy Jeff and the Fresh Prince and Salt ‘n’ Pepa to British audiences while working at Champion Records. He set dancefloor crossover standards with his Perfecto label. He produced the seminal dance/rock album: Happy Mondays’ Pills, Thrills, And Bellyaches. He remixed Massive Attack, while his version of U2’s “Even Better Than The Real Thing,” forged new ground in the realm of dance remixes. And he toured with U2 as a supporting DJ. All before making his way to the United States as a DJ. Having previously lived in New York in the ‘80s for a year and a half while working for Profile Records, during the 1994 visit Oakenfold asked pointed question after question, researching dance music’s presence in North America. He learned about labels, magazines, clubs, raves and the community. Always the astute businessman, his conclusion was it was too soon to try and forge a path here and wisely held back. Coming to America when the timing was right, contrary to popular belief, he did not ride in on the tails of his British counterparts who had made inroads here before him. Rather, in business-like fashion, he correctly chose a time when he felt the American audiences were ready for what he was offering. Due to the crowd’s favorable reaction to his DJing, Oakenfold escalated up the ranks speedily. 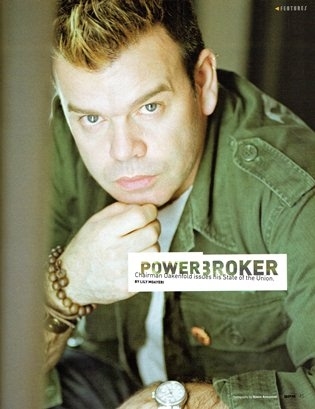 Recreating his celebrated residency at the UK’s famed Cream weekly in various cities across North America as closely as he could, Oakenfold took to heart what U2’s manager, Paul McGuinness, had told him years ago, “If you want to break America, you have to play all the small cities. Don’t worry about New York, Los Angeles, and San Francisco, you want to play all those towns in the middle.” Building a following from the ground up, each time he toured, the capacity of the venues rose exponentially, while his mixed CDs, particularly Transport and Perfecto Presents Another World (certified Gold domestically), started flying off the shelves. In 2001 he was tapped by Moby to headline the dance tent at the Area: One Festival. He quietly started working on his artist album, Bunkka, funding its recording himself for the first year of the two years it took to complete. Selling 800,000 worldwide (and counting), it generated a top ten smash in “Starry-Eyed Surprise.” Meanwhile Oakenfold dabbled in the film world, humorously portrayed himself in Rules Of Attraction, composed music for Swordfish, and contributed to Die Another Day, Planet Of The Apes, Austin Powers: Goldmember, Signs and The Bourne Identity. Enough producer activity to dispel detractors who don’t think he does the work himself. ALL ALONG, OAKENFOLD has taken a non-dance approach in his different career moves. Following a long-term route that is more suited to U2 than someone who primarily gets his push from the dance world, as clever as this is business-wise, the fact is, Oakenfold does not come from the same background, nor does he have that band formula behind him, making it a little disingenuous. Even before DJing, he was working in the music industry and came into it at an informed and high level. With Project Club at Ziggy’s, his first ever regular night in the South London suburb of Streatham, he was already somebody, he already had a nickname, he already worked at a label. While Bono sat at Granada Studios in Manchester day in and day out waiting for someone to cancel so U2 could get a slot on Tony Wilson’s “Granada Television” (which they never did), Oakenfold has never really struggled. That is not to say that he hasn’t worked hard, but there is something unauthentic about his position, which has always been from the outside in, not the inside out. Back in the day, he wasn’t so much the person who broke down warehouse doors to throw a party as he was the one who rolled up in style after the police had been handled. These days Oakenfold is intent on taking dance music into an environment where it is not generally heard. To that end, after playing in China in 2002, he approached the Chinese government about doing a party on the Great Wall—another shrewd business move that will be packaged impeccably and presented neatly, and more importantly, safely, to the public. Taking place in April of this year from sundown to sunrise, Oakenfold documented the event both aurally and visually for Great Wall. The hour-long documentary is for broadcast on British television and features the gig plus interviews with natives of Shanghai and Beijing. The CD version of Great Wall draws from the party, with new additions such as Oakenfold’s recent Madonna and Layo and Bushwacka! remixes, a remix of “Hypnotised” from Bunkka, some tracks from Perfecto artists, as well as material he has been playing at current gigs. Perhaps the issue isn’t as much a lack of stars as it is that dance music’s primary star—Oakenfold—represents a much less glamorous persona. Part of the appeal of hip-hop and rock is its defiance, the hustle the artists went through to get where they are, how they speak about the future including young people in it, their fantastically shameless display of wealth through flashy clothes, cars and houses. By buying items relating to that artist, people are buying into a bit of that lifestyle. With Oakenfold—who is bordering on being apologetic about his achievements—there isn’t anything of that nature. There is no denying the hours Oakenfold has logged. He is the most recognizable DJ in the world. He is revered and admired for playing it safe and smart. Nowadays artists are taking charge of their own destinies more actively. No one has control of their decisions and their outcomes more than Oakenfold, whose choices from the very beginning have been calculated and accurate. The fact that he is as manufactured as a boy band is completely acceptable, because it is himself who is doing the manufacturing and doing an impressive job of it. 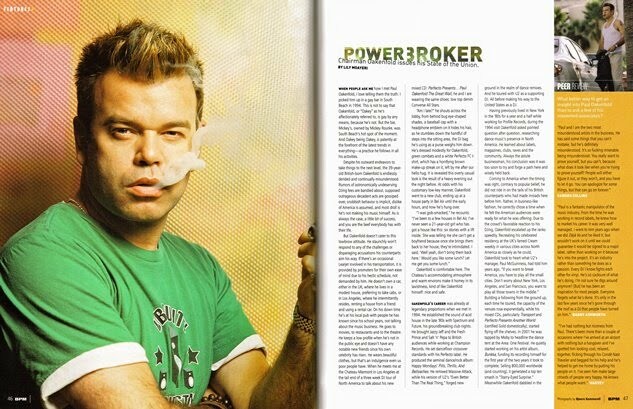 What better way to get an insight into Paul Oakenfold than to ask a few of his esteemed associates?